This ice cream is extra special for a couple reasons. 1. Michael requested it as his birthday treat. 2. It was my first time using my ice cream maker! 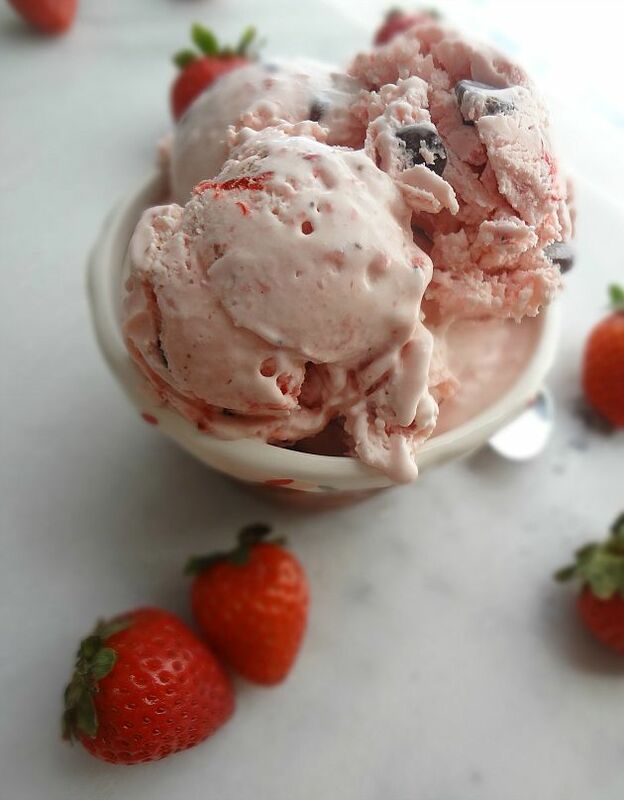 I'm so glad this was the recipe I started with for my first foray into real ice cream--it was kind of insanely easy. Like...you blend a bunch of stuff together and then you put it in the ice cream maker. Then you add in some mashed strawberries and chocolate chips and...yeah. The end! And seriously...how pretty is it? 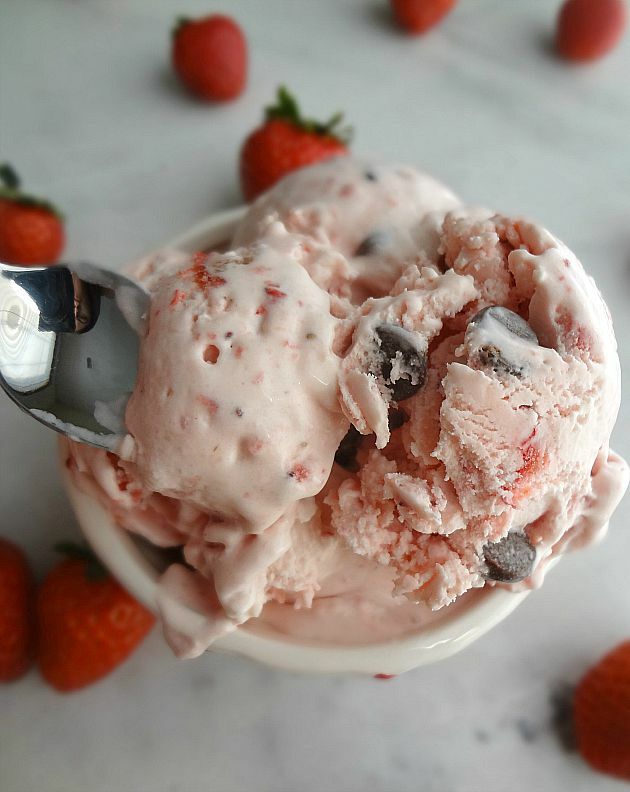 No food coloring here-just naturally pink strawberry-liciousness! It's also super creamy, thanks to the cream cheese. I will make a small note that if you freeze this extra long/store it in the freezer-it does get quite hard so I suggest taking it out for a bit to soften prior to serving (unless you gobble it all up straight out of the ice cream maker, that's cool too!) Also, this recipe doesn't make a bunch but I actually made another batch almost immediately after-so you can totally double the recipe if you have a hungry Michael type person in your house. Makes 1 pint but can easily be doubled. 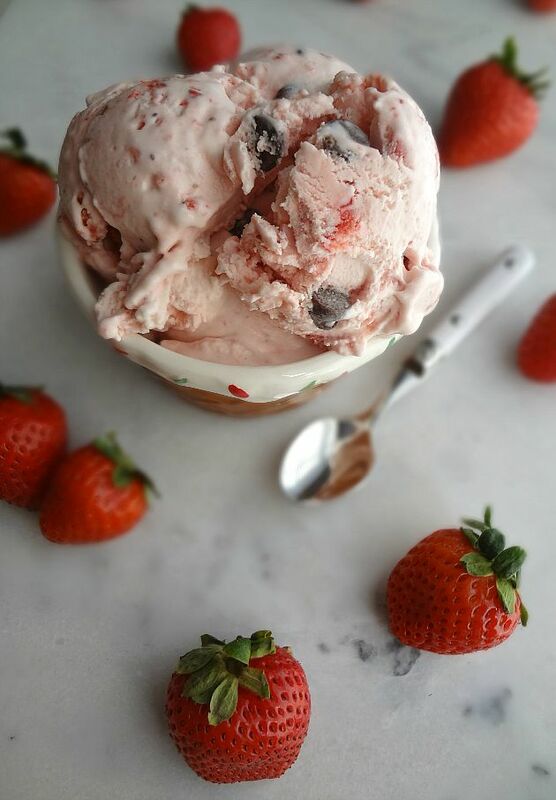 In a small-medium bowl, mash 1/2 cup sliced strawberries with a spoon or the bottom of a flat glass. In a blender, blend together the remaining sliced strawberries with cream cheese, milk, heavy cream, sugar, and vanilla. Serve! If you'd prefer a harder ice cream, store in an airtight container in the freezer for at least 1-2 hours. If storing for much longer than that, take the ice cream out of the freezer for about half an hour-hour before serving to allow it to soften a bit. I love all the pretty pretty reds and pinks! !